Generally, Ultrafiltration (UF) is a separation process using membranes with pore sizes in the range of 0.1 to 0.001 micron. UF membranes are able to remove high molecular-weight substances, colloidal materials, and organic and inorganic polymeric molecules. On the contrary, low molecular-weight organics and ions such as sodium, calcium, and sulfate won’t be removed by UF Membranes. 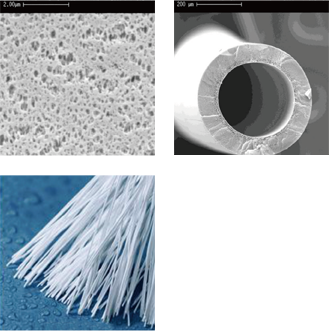 Among all types of Ultrafiltration, Hollow Fiber (with pore size of 0.1 micron) is commonly known for its use in drinking water purification since it’s utility to separate suspended solids, colloids and bacteria from tap water by using physical barrier. Specifically, Hollow Fiber is small tube-like filters and its end are sealed in order to collect purified water from cartridge. Besides, due to Hollow Fiber has tremendous amount of surface area with high permeability a small volume. In this way, it can provide higher purified flux and requires low working pressure. To sum up, Hollow Fiber Ultrafiltration technology offers an economic method to get the microbiologically safe water in daily life.